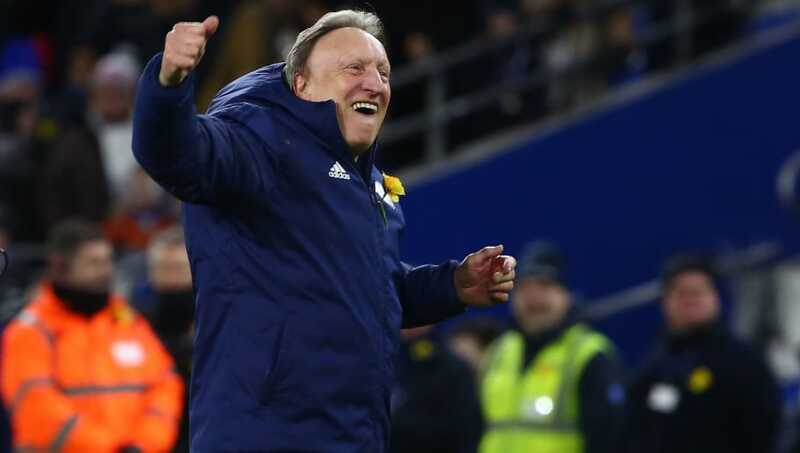 Cardiff manager Neil Warnock admitted he couldn't hold back the tears following the Bluebirds' hard fought victory over Bournemouth in which he says the side "did Sala proud." The 70-year-old manager was visibly emotional at the final whistle after witnessing his Cardiff's spirited performance against the Cherries where a brace from birthday boy Bobby Reid secured all three points for the Welsh side in difficult circumstances. There had been a mosaic bearing Emiliano Sala's name, players and officials wore daffodils and the home supporters exhibited their new 'song for Sala' throughout a memorable 90 minutes for the home side. "I was alright until the final whistle went and I went on the pitch," Warnock said following the win. "The last 10 days or so, I can't begin to explain how difficult it's been. Knowing the lad, Emiliano as I did, I knew he'd have been really with us today. "I just thought the whole club was amazing. I was really pleased for the chairman, Mehmet Dalman and Ken Choo. I was the proudest man to be manager of the whole club today, because the fans were just amazing. Following the game, Warnock walked onto the pitch to celebrate with fans - but emotions got the better of the usually feisty character from Yorkshire. "It was strange. I was alright until I got across to the far side. Some of (those fans) usually go home earlyish, but it seems everybody stayed - and the noise volume was...it just got higher and higher. "I've never heard anything like today, ever, and I'll remember it for the rest of my life. I just felt today really immense pride in everybody. “The last two performances (since Sala disappeared) have been the best we’ve produced all season. We don’t really know when we are beaten. I can’t be more proud." Cardiff travel to St. Mary's Stadium to face ​Southampton on Saturday with Warnock's side looking to climb out of the relegation zone.